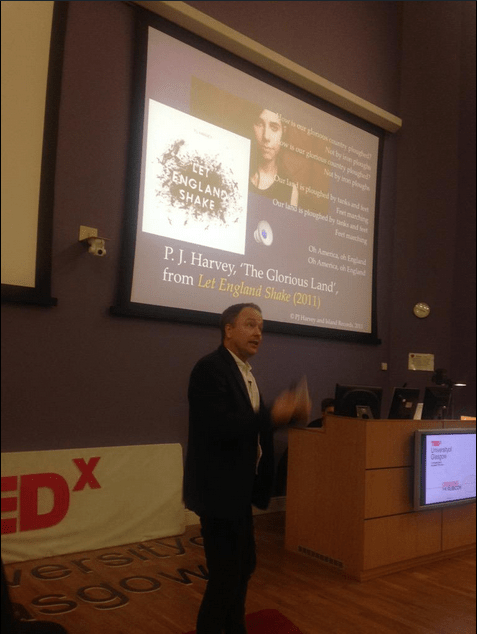 David Code, Reader in Music at the subject area, talks about his recent experience with public engagement – from Debussy to PJ Harvey. I greatly enjoyed participating in a couple of public engagement events in recent weeks, both of which will soon be available online. First of all, I was invited (on the recommendation of one of my first-year students! go figure) to contribute to the student-run event TEDx University of Glasgow – that is, the day-long series of talks modeled on (and licensed by) the well-known TED organization, held in the University’s Charles Wilson Lecture Theatre on Saturday March 7. I was really impressed with the energy and imagination the student team brought to the organization of this event, and greatly enjoyed the talk itself, before a lively audience made up both of students and public visitors. I was also impressed by the way the video team later squeezed my … er … expansive improvisations (so valuable in the lecture room!) down to the precise 18-minute TED remit – at significant loss only of a certain ‘military bugle’ riff in PJ Harvey’s song ‘The Glorious Land’. Anyone who can spare me 18 minutes once the whole TEDxgu video package is launched – watch this space! – can easily make up for this excision by seeking out the song (and the whole brilliant album) on the web. David Code during his talk at TEDxgu. Not long after this, I was thrilled to be invited by the BBC to contribute an interview about ‘Debussy in 1915’ to the Radio 4 series ‘1914-1918: The Cultural Front’. This third and last episode of the current series, ‘War on the Mind’, also includes segments on Freud’s wartime writings, German expressionist painting, the suffragette impresario Lena Ashwell, and the poetry of Robert Frost. My interview at the BBC’s Pacific Quay complex, with Francine Stock (from London) and producer Mark Rickards (in Glasgow), lasted something like forty minutes – I look forward to finding out which brief excerpts they deem broadcast-worthy ‘highlights’! Check it out on Saturday May 2 at 10:30 am – and online thereafter.